With 73 percent of high-intent traffic happening outside of company websites, it’s important to reach your potential customers where they are. When people are searching for solutions to a problem, be it a craving for mozzarella sticks or a desperate need for a new roof, they want information quickly. Google knowledge graphs allow people to get all the information they need without ever leaving Google. For you to reach these customers, you need to have accurate, relevant information, including positive reviews. Luckily, your business’s knowledge graph is easy for you to edit. Unfortunately, your business’s knowledge graph is easy for anyone to edit. This means that while it’s easy to log into your Google My Business account to change an outdated phone number, a well-meaning customer can suggest that it be changed back, or Google's algorithm might find another listing with the old number. In addition to frustrating the people trying to call your business, this conflicting information will make the algorithm trust your listing less. Consequently, your business’s information will be less likely to appear to searchers because Google isn’t sure if the information is correct. To avoid this issue, you can manually go through and change your information everywhere it appears online or use services such as data aggregators or digital knowledge management companies. Knowledge graphs also value user input. After seeing a knowledge graph, customers are often asked if they know information about the business. 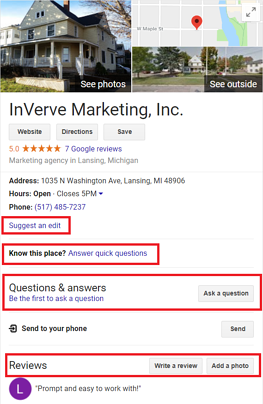 Google allows users to give reviews, ask and answer questions about your business, and suggest edits to information like store hours and the street address. To make sure users get the information they need, regularly check that your information is correct and the reviews and answers to questions are helpful and accurate. Knowledge graphs are a way for searchers to get answers to their questions without needing to navigate multiple websites. 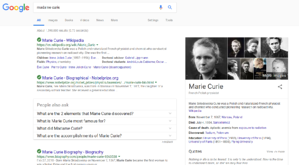 To give people looking for your product or service the information they need in the place they’re looking for it, it’s important that your knowledge graph is prominent and accurate. By using Google My Business — combined with a lot of searching out incorrect information about your business — you can make sure your business is there for the people you can help. Does this seem daunting? InVerve Marketing & Web can help! Not only can we ensure your information is correct and stays correct, but we can also manage your listings with strategies like structured data with Schema markup to help your business appear above the competition.